Between August and September of 2008, as our celebration of the 10th anniversary of the Studio Theatre came to an end, our situation at the Studio Theatre deteriorated in the wake of a new Board of Directors coming in there. By October, our long-standing agreements with the Perth Theatre Project were dead and we found ourselves out of the home we had largely built, funded and kept going for over a decade. The next couple of years would be tough. Below: Katharine, Karen and Kristy. The three K's. Not a BarnDoor Production, per se, but with direction by Janice Jacklin, sets and tech by David Jacklin and featuring Sean Jacklin as the Tin Man and Sydney Jacklin in the chorus, it was definitely related! A remarkable production that pushed the PCC technically to the limit -- and was a sell-out hit, too! 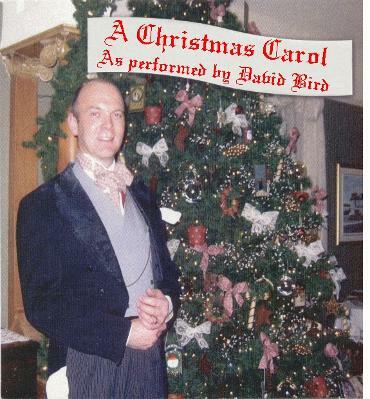 Our long-time veteran (go back through the history here and see how many times you find his name) brought his one-man performance of Dickens' A Christmas Carol to life in a dinner theatre performance for two nights only at the Gore Street Grill (now defunct). Two sold-out shows later showed that he is Scrooge -- and Marley and Cratchit and all the rest. Above: Janice Jacklin, Marilyn Bird, Kristy Tait-Angel, Sydney Jacklin. The ladies have put the set up backward and play the first twenty minutes to the back of the stage! Below: Janice Jacklin and Gary King. It wouldn't be Farndale if Gary didn't end up in drag. A comedy by David McGilvray and Walter Zerlin Jr.
On the big stage at P&DCI high school, we had some more FAHETGDS fun. This time, the ladies demolish the Scottish play and a good time is had by all. 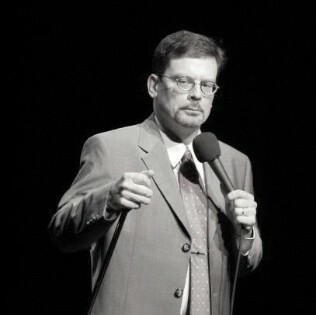 We had a unique opportunity to bring Genie-nominated comedian John Wing (well known for appearances on CBC Radio, the Comedy Network and much more) to Perth for a special one-night only performance. John is a university chum and we had a great time getting re-acquainted and an even better time laughing to the contents of John's zig-zagging mind. A rare treat. Right: the lobby from the main entrance. Tom Van Dusen, our real estate agent, in the picture. Below: The interior of the auditorium as it was. In June of 2009, we discovered our new home, a car wash! Many years before, we had seriously considered the possibility of converting the then-vacant building at 26 Craig Street in Perth to use as a theatre, but weren't able to swing it at the time. It was purchased by acquaintances Charles and Daphne Henderson and made into Charlie's Car Wash in 1986. We used to pass the building and joke that Charlie was keeping our theatre open for us. In August of 2009, we purchased the building from the Hendersons. Anyone with any theatre experience can look at the building as it was then and see the potential for development into a theatre -- right? Well, maybe.